A hatch-year female Slate-coloured Junco made history for MBO this week - details below. Notes: No banding again this week - despite the calendar having rolled over into March, it has been cold, and combined with the wind, the weather has been marginal enough that we'll wait until temperatures rise a bit again. Nonetheless, we have some exciting news to announce. After having banded well over 5000 birds since MBO's inception, we at last have news of one of our birds having been recovered elsewhere! 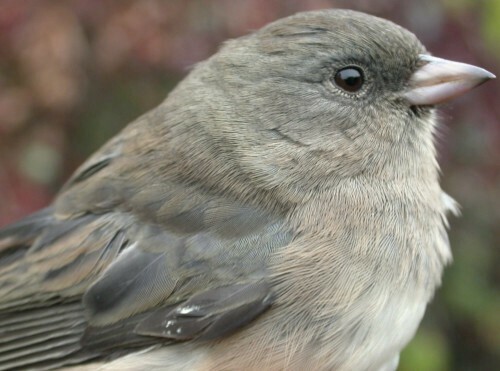 A female Slate-coloured Junco, banded as a hatch-year individual by Crissy Ranellucci on October 25, 2004, was recaptured by a bander in Scotch Plains, New Jersey (just southwest of New York City), on November 24, 2005. Closer to home, activity at the feeders was relatively unremarkable this week. Of note, however, the Northern Cardinals have become steadily more vocal, and the Blue Jays have increased in number of late.